The BMW M60 V8 came into production in 1992 for the E32 740i and then the E34 540i in '93, continuing in the E34 and newer E38 740i until late '95. Available as a 3 litre (M60B30) with 218bhp and a 4 litre (M60B40) with 282bhp @ 5800 and 295lb/ft @4500. It was developed over an 8 year period and used a head design layout similar to their successful M88 and S14 engines used in the M1 and the M3. It's an alloy block with silicon/nickel lined bores, alloy heads and magnesium valve covers. Other modern features for it's time were the nylon inlet manifold & plenum, sintered conrods with fractured big-end cap fitment and double roller-chain cam chains. It was one of the first 32 valve V8s to come into mainstream production in a luxury saloon and was at the top of the Ward's best engine of the year list for some time. It's physically quite large, especially in width due to the DOHC cylinder heads, which get in the way of the brake booster on a lot of conversions. The 4 litre and the 3 litre have the same external block dimensions, and the bolt patterns for the sump and the gearbox are the same, also the exhaust manifold spacing and bolt pattern is identical. The cam duration for the M60B40 is 249/241. Standard valve timing is 48/14 exhaust and 14/52 inlet. Cam lift is 9.7mm inlet and 9.4mm exhaust. Valves are a generous 35mm inlet and 30.5mm exhaust. 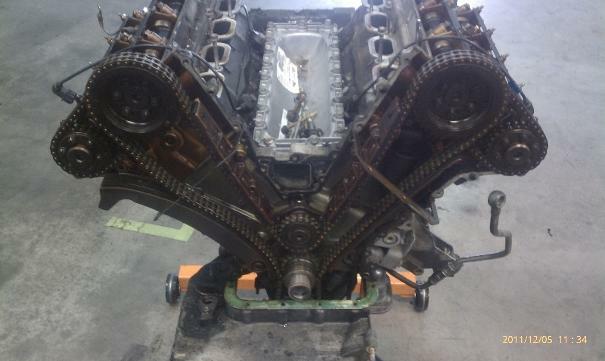 Engine weight - after weighing all the engine components seperately whilst rebuilding it, the bare block is around 30kg, the crank 19kg and the heads (complete with valves & cams) 27kg each. I make it a total engine weight of around 175kg complete with exhaust manifolds, alternator, starter, inlet manifold and valve covers, etc... (minus AC & PS pumps), or nearer 190 with AC & PS, oil and coolant. The engine was updated to the M62 version which came in the new E39 5-series in 1996 and also in the E38 740i, and was available in 3.5 litre and 4.4 litre capacites, with 235 and 286bhp respectively, and coded M62B35 and M62B44. The 4.4L has the same 282bhp the M60B40, but was designed to have a stronger torque curve from lower rpm, with 310lb/ft peak @3900rpm. Bore and stroke for the M62B44 was 92mm x 82.7mm. Cams where reduced slightly to 246/240 duration with 9mm lift. The sump pan, exhaust manifold and the gearbox bolt patterns are the same as the M60 (same 98mm bore centres). 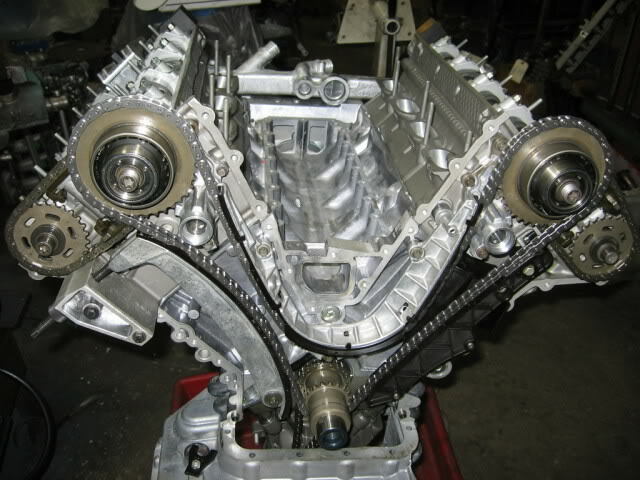 The main difference is that the M62 reverted to a single-chain timing chain setup, so the timing covers are quite different. In 1998 the M62 was updated again with BMW's VANOS system (variable valve timing) which works on the inlet cam and is known as single-vanos and these engines were coded M62TUB44. Unlike many other variable cam timing systems available at this time that just switch from one fixed cam timing to a different setting at high rpm, the BMW system varies the intake cam timing throughout the rev-range. If an aftermarket ECU could control and allow adjustment of this type of continuously variable cam-timing then it would be a very powerful tuning tool. BMW chose to use a hi-tec bore-coating process for the M60 which enabled them to do away with the iron cylinder liners that were previously used in aluminium engines like the Rover/Buick V8. The Nikasil process was an electrodeposited lipophilic nickel matrix silicon carbide coating (developed by Mahle in the late 60s) and cannot re re-applied by conventional machine shops. Problems arose with the coating wearing out too quickly and BMW blamed this on the high sulphur content found in low-octane fuels. When warranty problems arose BMW dealers had the engine blocks replaced with identical new blocks.